"Walking through Time: Visiting the Past"
Maggie Larimore (Nancy's SL name), the curator of The AZIRE Library and Learning Center in the Chilbo neighborhood on the mainland island of Jegeot in Second Life, will take you on a journey through 1) experiences of a past time mingling with the present, spontaneously; and 2) in places known to be haunted. These hauntings of an usual kind, or time slips, give us a glimpse of the ever present now. 6. PLEASE HAVE ALL MICROPHONES OFF unless you are offered the opportunity by our guest to ask a question. 7. THANK YOU FOR COOPERATING AND PARTICIPATING! 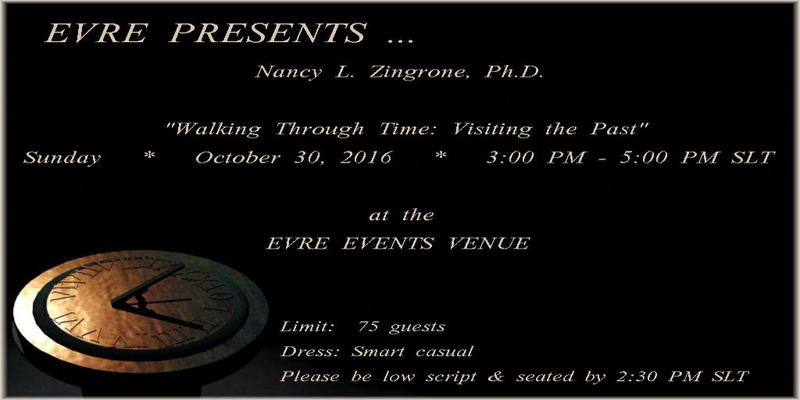 *If you cannot make this event, there will be several more guests giving presentations before the sim closes on December 31, 2016. I would like to publicly thank Maggie for her presentation and for her unwavering and time consuming crusade to make many events happen on EVRE to help me get the word out and spread awareness of the new science in the field of parapsychology and Psi. Together, we can make it un-taboo and find new worlds, especially the worlds that have been there all along!